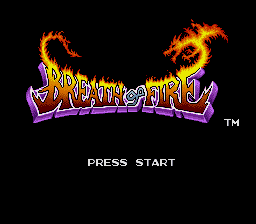 Breath of Fire, first of that name, I hail thee. Without this one, folks, a nicely done series would not exist, for this started it all. The day begins with a bit of back story about the world you’re in, about two clashing families, or clans… the Light and Dark Dragon clans. 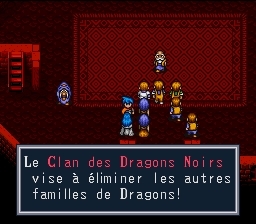 These are not actually DRAGONS, but people of the same clan. But… the special thing is, every clan name gives you a rough idea of physical or spiritual appearance/ability. 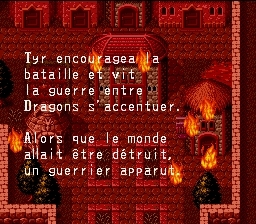 You, the hero, leave your village after it is attacked by a group of Dark Dragon clan members. Everyone in the village is turned to stone by a girl named Sara, in the hopes that no one else will be hurt in the fire spreading throughout the village. After everyone turns back to normal, there is a small scene of talking, and off you go, half-cocked and with a cool dragon-clan symbol ‘pon your brow. This game features an interesting cast of characters to utilize, and will keep you entertained for a nice while. If you’ve not tried any of these, do start with the game that began it all. 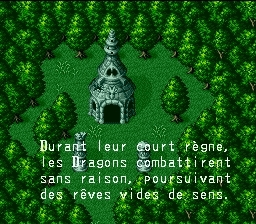 If you’re an RPG fan, you won’t be dissappointed, I’m sure. The first game of the Breath Of Fire serie translated in french. The rom has been expanded from 1.5 to 2Mo in order to fit more text and a nice intro screen has been inserted.